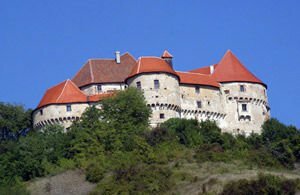 Veliki Tabor castle is one of the best-preserved and authentic medieval fortifications today in Croatia. Veliki Tabor dominates its surroundings in the Croatian province of Zagory. Very close to the medieval structure is the interesting Desinich village and the surrounding landscape is unique with the picturesque mixture of dense forests, alternating lush meadows and vineyards, located among the rounded hills. The medieval town of Veliki Tabor is located just 3 km east of the town Deslinich. According to historical sources Veliki Tabor in medieval times was known as Vingrad and Vrbovets. Most of the structure of the fortress, which has managed to be preserved today dates from the 16th century but the castle was built several centuries before. Today Veliki Tabor is considered the best preserved Renaissance fortress in Croatia, built entirely in the spirit of a typical Renaissance Housing defensive architecture. In the late gothic castle times Veliki Tabor stands on its hill, pointed in the front part without retaining walls. A little later the castle was surrounded by defensive walls, every corner has stood on it a watchtower with a semicircular shape. A significant part of the fortress wall has a second level, appearing on multiple consoles. Further Veliki Tabor is restored, but generally has not suffered major reconstruction, with the result that today it can boast an enviable authenticity. Today the walls of Veliki Tabor still show the patterns of the late gothic period and the Renaissance of its changes. Among them are a stone coat of arms with stone signs and several horse images. The castle is particularly attractive with its bay windows and arcades in the courtyard. From the former foreign defensive wall now remaines only one pentagonal bastion. According to the most credible assumptions castle Veliki Tabor and his defensive residential complex were built on the orders of Ratko, who received the land in this world area as Zagory was generously donated by Corvin I. The year was 1502, a closed city, Veliki Tabor remains in possession of the family of Ratko until the last heir of the family died in the city in 1793. In the following centuries Veliki Tabor was first state-owned, and then later became a private possession. Between the two world wars Veliki Tabor belongs to O. Ivekovich.